I’m Shannon from community regeneration; and I’ll be taking you behind the scenes of our last project of 2018. 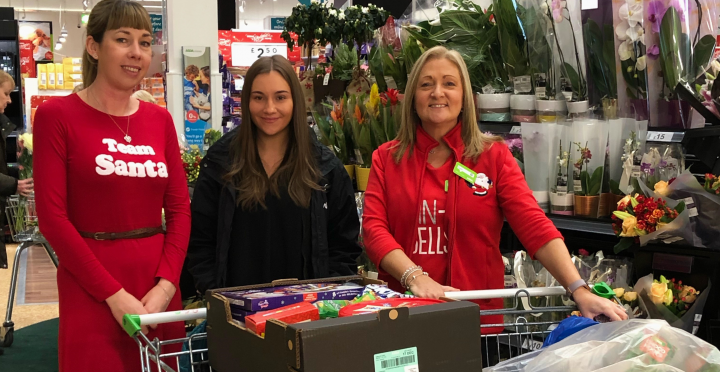 Our aim was to create and hand deliver 50 Christmas hampers to individuals and families going through financial difficulties. Here is how we did it! The team got together at the start of December to discuss how we would complete this project within the timescale (only 3 weeks). 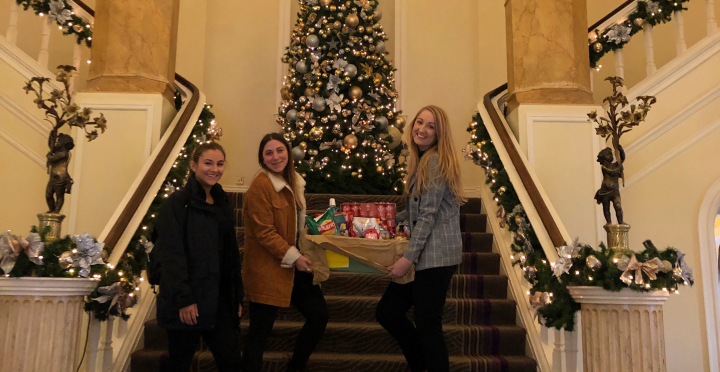 We carefully planned how we would collect contributions; pack the hampers (Tetris experience was essential); deliver all 50 hampers in one day; and who would be doing the deliveries. We covered all areas and possibilities. Our housing officers, financial inclusion officers and the HAPI project identified families and individuals. Tesco (Upper boat and Barry). The Co-op (Barry and Aberdare). Here we have (from left to right) Shannon and Adele from Newydd, and Kim from the Angel Hotel in Cardiff. Morrisons’ Barry Community Champion presents their contribution to the hampers. I would like to personally say a massive thank you to all who donated to this campaign, we would not have been able to do this without your help and kindness. We individually spoke to every person who would get a hamper to ensure we could tailor it to them. Including whether they had children, were a family household, had allergies or owned pets. In this case, were able to give pet food having received a generous donation from Hope Rescue. Thanks again Hope Rescue, you’re the best! 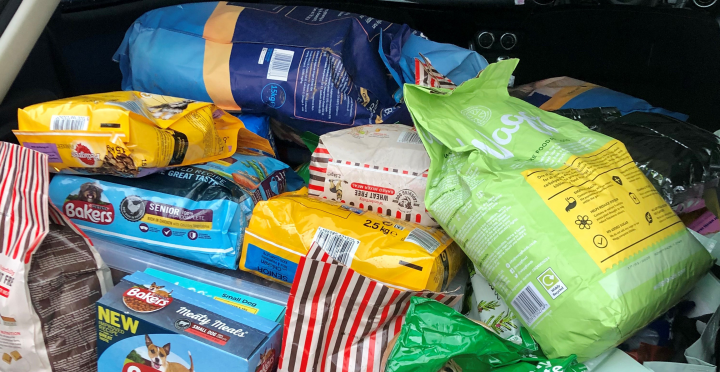 Here is the sizeable donation of pet food, given to us by Hope Rescue. Newydd staff volunteered a few hours of their time to help assemble the hampers. As a result, this was an excellent way for colleagues to interact and work as a team. This was a huge success, with dozens of staff members pitching in. 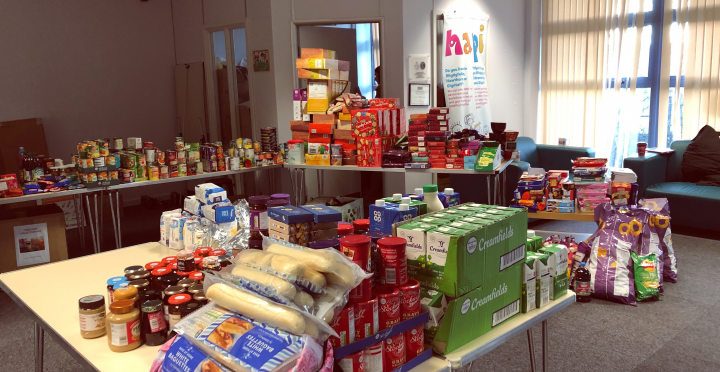 A room full of essentials and treats for our families in need, ready for packing! We were able to effectively plan the deliveries having worked out who would get a hamper. Destinations spanned the length and breadth of RCT and the Vale of Glamorgan. We had the help of staff across the organisation and were able to load up several cars (and a motorbike) on the morning of the delivery. 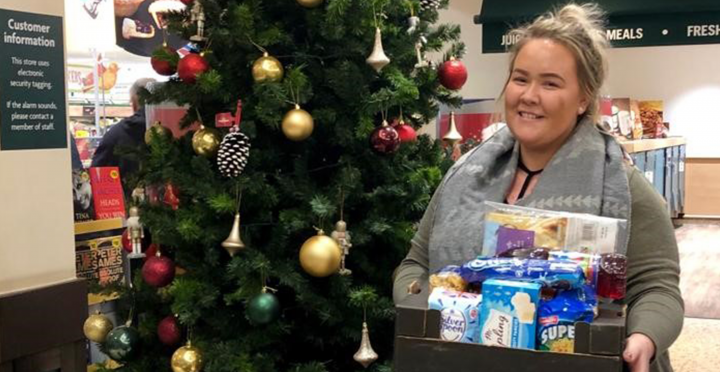 This has been our first ever Christmas hamper campaign. Soon we will review what went well, but also what we could have done better. In short, by doing this we can do something similar in 2019 (but bigger and better). I’m proud to be able to help people in the community who are going through financial difficulties, especially over the festive period.